Tucked away from the tourist tracks, this family run restaurant is truly a hidden gem on Ambergris Caye. Over the past 10 years, Hidden Treasure has become a must-visit for both locals and visitors alike who are looking for somewhere special to gather and dine. The attentive staff and creative Caribbean flavors make this a truly exceptional dining experience. 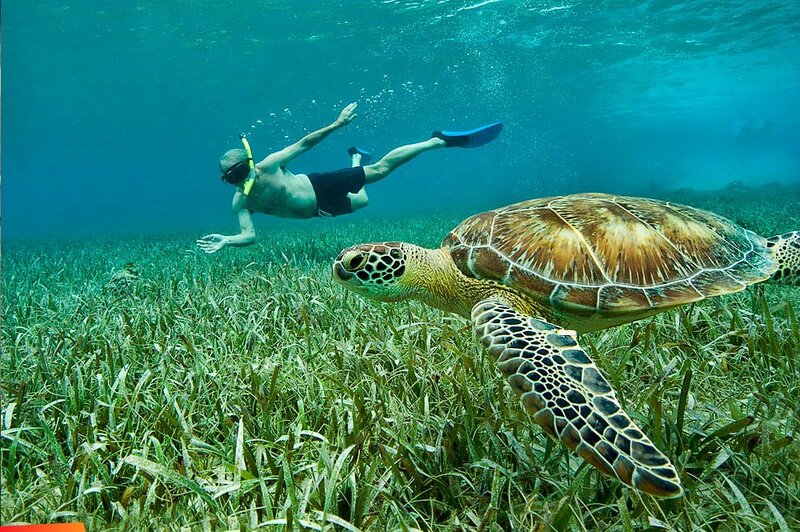 Hidden Treasure has been awarded the “Restaurant of the Year” by the Belize Tourism Board many times over. Reservations recommended. Blue Water Grill is a staple, popular with locals and tourists alike, and a must for anyone visiting Ambergris Caye. Located in the Sunbreeze Hotel, this beachfront restaurant is a perfect place to dine and enjoy the many colors of the Caribbean Sea. Chef Chris Aycock blends Caribbean and international flavors to create a truly unique and diverse menu that you won’t see anywhere else on the island. Blue Water Grill serves breakfast, lunch, and dinner so make sure to stop in for at least one meal during your stay! Wild Mangos is the perfect place to stop in for a laidback lunch or dinner on the beach. Serving up a mix of fresh and creative salads, 9 different types of ceviche, fresh smoothies, and Mexican & Caribbean inspired main dishes, there is truly something for everyone to enjoy at Wild Mangos. Elvi’s Kitchen opened in San Pedro over 40 years ago and to this day remains a favorite. With its sandy floors and the beautifully lit indoor tree, a meal at Elvi’s reinforces that you are in the tropics! Elvi’s offers a wide variety of fresh seafood and traditional Belizean favorites like stew chicken with rice and beans. Be sure to make a reservation as Elvi’s fills up quickly! If you’re looking for a dinner with a view, Rain is the place to go. Located on the rooftop at Grand Caribe, this is one of the best places to watch the sunset over the lagoon while sipping on a cool drink. Rain’s menu is a blend of Argentinian, Spanish, and Caribbean flavor offering a unique fine dining experience in San Pedro. 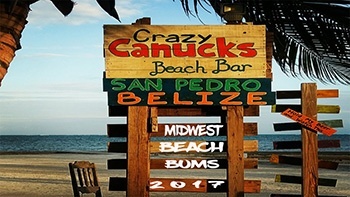 Visit Crazy Canucks on a Sunday and you’ll be tempted by the delicious smells coming from the grills lining the beach. Usually offering a selection of chicken, pork ribs, and Italian sausage, served with coleslaw and either rice and beans or beans and a flour tortilla for a reasonable price, typically around $15-20 BZ for a heaping portion of food. El Fogon is another family owned and operated restaurant offering traditional Belizean foods cooked over an open hearth (the fogon). El Fogon strives to share the rich culinary tradition of Belize to all who dine there. The Truck Stop is Belize’s first shipping container food park featuring 5 distinctly different food and beverage options: Truck Stop bar, Cool Cone Ice Cream, Rasa - Southeast Asian restaurant, Arepa – a South American truck, and Slice of Haven – a pizza truck. In addition to great food and drinks, Truck Stop offers a newly opened pool, weekly movie nights, trivia nights, farmers markets, and game show nights (think the Price is Right, Family Feud…) providing a fun place for tourists and locals to mingle and have fun. If you’re looking for quick and inexpensive eats, Neri’s is the place to stop for breakfast or dinner. Offering traditional Belizean breakfast tacos and other favorites like stuffed fry jacks and burritos – you won’t leave Neri’s hungry. At Neri’s you can fill your belly to capacity for less than $5 USD, tacos are sold in 3’s for only $1 BZ and other dishes are around $4-5 BZ. Popular with locals, there can be a line, but it is well worth the wait. Offering a variety seafood cooked in any of their 15+ sauces, The Hungry Grouper is a great spot for a taste of what is fresh that day. With a sandy floor and just a few tables, The Hungry Grouper is a popular lunch destination. Portions are substantial, so make sure to bring your appetite!